The Oasis at The Retreat is a 20,000 square foot clubhouse which gives you the comfort and feel of resort-style living. This state-of-the-art resort clubhouse has plenty of features and amenities. 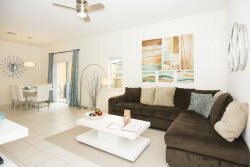 This resort is a premier option for travelers looking to enjoy the home and have a nearby clubhouse and pool, where the family can go to enjoy some sun! A short walk from the pool area is the main clubhouse with theOasis Grille Restaurantand bar, afitness center,familycinema,kids play/craft zoneand more.